BETHPAGE, N.Y., April 14, 2011 -- Following a successful Defense Acquisition Board review, funding for an additional 10 E-2D Advanced Hawkeye aircraft has been authorized. The authorization comes just a short time after the Northrop Grumman Corporation (NYSE:NOC)-built E-2D made its first carrier landing, aboard the USS Harry S. Truman . An Acquisition Decision Memorandum, signed by Dr. Ashton Carter, undersecretary of defense for Acquisition, Technology and Logistics, validates that the E-2D Advanced Hawkeye program is continuing to successfully execute all cost and schedule requirements and is on track to enter Initial Operational Test and Evaluation later this year. 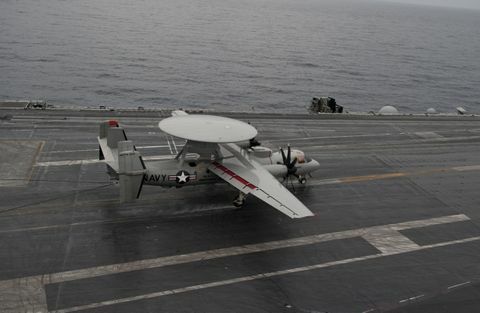 "This is a significant milestone for the E-2D Advanced Hawkeye program," said Jim Culmo, vice president, airborne early warning and battle management command and control programs, Northrop Grumman Aerospace Systems sector. "The entire Advanced Hawkeye team continues to work tirelessly to meet the commitments we've made to our U.S. Navy customer. Delivering this advanced capability, on time and on cost, continues a legacy that began more than 50 years ago and ushers in a new era in airborne early warning and battle management command and control." "The E-2D continues the Navy's integrated warfighting legacy by providing broad area coverage resulting in increased range capabilities," said Capt. Shane Gahagan, Hawkeye-Greyhound program manager, U.S. Navy. "With the E-2D's enhanced ability to work in the littoral areas and over land, the platform provides a critical capability to protect our nation's interests." The Navy's program of record is for a total of 75 aircraft, with deliveries through 2021. "As the Navy celebrates its Centennial of Navy Aviation, Northrop Grumman continues to be committed to providing this critical first line of defense well into the 21 st century," said Culmo. To date, Northrop Grumman has delivered five E-2D aircraft to the Navy and production on the 10th aircraft recently began at Northrop Grumman's East Coast Manufacturing and Flight Test Center in St. Augustine, Fla.